– There were empty seats on the hard camera side all night long. The floor seats on the hard camera side only had a handful of people sitting in them for the first two hours. I did not notice Michelle Beadle and her crew sitting there there until closer to the third hour. It seemed like once she was seated, those first couple of rows filled up. I did not know Gerard Butler was there until reading it online after. – Tough position for Natalya and Alicia Fox to be in starting the Superstars taping. With the early West Coast start time, they were in the ring just after 4:30 p.m. on a Monday and a lot of people were still filing in. 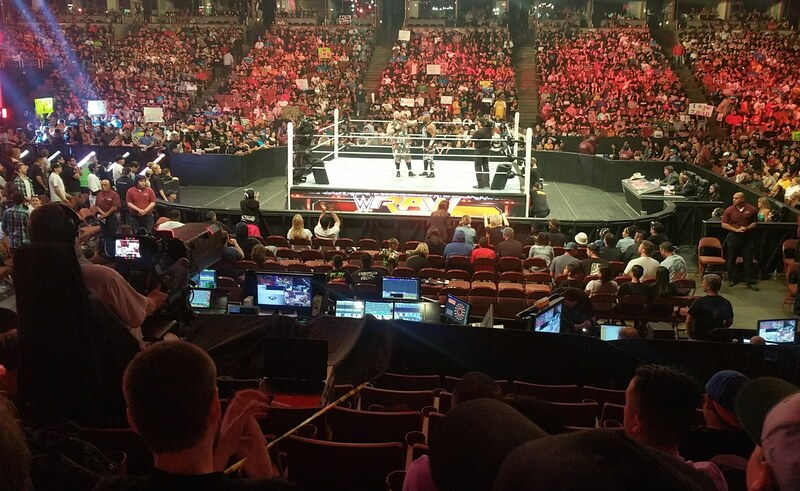 – Curious that there was no opening pyro as Raw went live. Stephanie McMahon is way over as a heel. Major heat for her. It was interesting to see the “Fatal Five-way” live. The guys that weren’t being featured in the ring just kind of laid on the floor waiting for their cue to enter the fray. During one of the commercials, Kevin Owens put on JBL’s hat and gave Tyler Breeze (I think) a clothesline from hell, which popped the crowd with a “JBL” chant. – One drawback to being live in the arena was that I couldn’t fast forward through the New Day Promo. I can only assume this appeals to the kids in the audience? During the Big E. vs. Mark Henry match, not sure how it came off on TV, but the Mark Henry injury looked legit. The ref called the trainer/doctor over immediately. Henry stayed in the ring for a bit before rolling out and walking to the back. – For my money, The Miz vs. A.J. Styles match was the match of the night. Styles was WAY over with the crowd and Miz was great here, too. I don’t think people appreciate what a utility player Miz is for the company. He’s been around for over 10 years now which is amazing considering the names that have come and gone during this time. – The Paul E. promo was fantastic live. It’s always a treat going to a show that Heyman is on. Big crowd pop for Roman Reigns when his music hit. However, once he started speaking, the boos were deafening. – The third hour really drags when you are live in the arena. WWE certainly did not help this case with its booking. The crowd was not sure what to do with the Social Outcasts and there were lots of “We want Sasha” chants during the Becky-Naomi match. Big pop when her music finally hit. Sasha walked around about three-fourths of the ring waiting for Tamina to give Becky the Samoan Drop before she entered the ring. It was awkward as she was clearly waiting for a cue to enter the ring. – Before the Big Show vs. Braun Strowman match, while the arena was dark, a bunch of production people ran out from the back and stood around the ring for a bit allowing Kane to sneak under there. – Not much of a dark match as Dean Ambrose & Reigns called out the Dudley Boyz only to be answered by the New Day. The Dudleys ran out soon there after giving the heels the numbers advantage before the Usos ran out making their only appearance of the night. The crowd enjoyed Ambrose, Reigns, and the Usos celebrating to end the night. – Overall, a good experience. I kept thinking we might get a Stone Cold appearance for a quick promo plugging the podcast since he was in the building and the roster is obviously thin right now. The show could have used his shot of adrenaline to keep the live crowd invested or simply to wake them up during the third hour.